Fry bacon add the onion and chopped cabbage to bacon drippings. Add Worcestershire sauce and black pepper. Sprinkle crumbled bacon and serve. 551 members have added this recipe to their cookbook. My mother and I love cabbage, I was thinking I was going to have cut out the bacon! Woohoo! Loving this site. I'm so stoked! yummy!!!!! even my picky kids loved it. This was really good! I will make again. made this the other night and it was great. Next time I'm going to add apples while the cabbage is cooking.Last time we had applesauce and it cost a lot of carbs so this will cut it down and we will begetting our fruit. Seems like a lot of sodium an saturated fat.... I have high blood pressure! WOW, The bacon with the cabbage made this dish taste very good. I have made this quite often. If you cook it in a stainless pan you can deglaze it with 2 tbl. chicken broth for extra flavor. This was great! I served it with spicy polish sausage, wonderful. My non-cabbage eating husband had seconds! 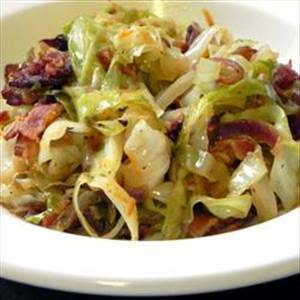 There are 298 calories in 1 serving of Fried Cabbage with Bacon. Calorie break-down: 76% fat, 12% carbs, 11% protein.